These cute cat designs make great gifts for cat lovers and cat sitters. If you share your home with cats, you might also share the bathroom with your feline buddies. Let your house guests know that the restroom is for your feline companions too by hanging or sticking one of these funny signs above your bathroom door! Or add a dose of cat-inspired hilarity to your day with these funny designs on t-shirts or cards! Love to have a kitty on your lap? 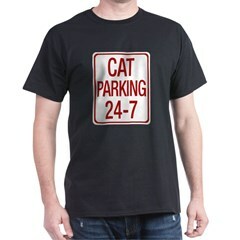 This fun top reads like a traffic sign but instead marks your belly area as an exclusive parking zone for feline friends! This funny design is great for anyone that loves cat cuddles. This cute LOLCat design is a spoof on the popular LOL cats circulating the internet. 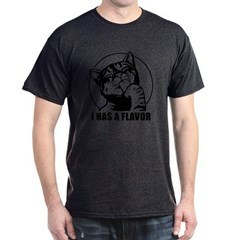 A cat is licking its paw and the text reads I Has A Flavor. Great cat designs here for cat lovers and cat sitters. Why Is All The Catnip Gone? Dit cat is totally stressed out. Cute gift ideas here for people who could need some relaxation. Do you sometimes feel like the kitty on this design? 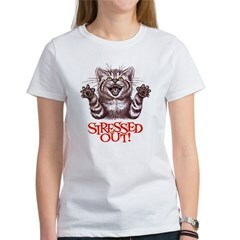 Then show your friends how you feel with this stressed out t-shirt design. If your cats are like the ones I know, they adore food and they aren't afraid to say something about it. Food-loving cats are on the Meow for Food Program every day. This is a totally cute spoof-style design for real cat lovers! 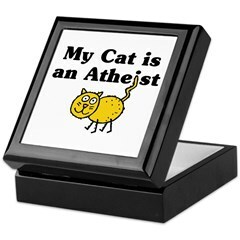 A cute cartoon cat poses under text reading My Cat is an Atheist. A cute design for cat lovers that want to make a religious statement - or lack thereof. 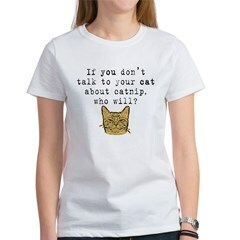 If you don't talk to your cat about catnip, who will? Cat lovers will love this humorous phrase. Make sure you warn your kitten about the dangers of this highly addictive drug. Two designs to choose from. 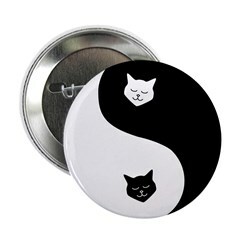 Relax, meditate and bliss out with this black and white yin yang kitty design. Peaceful, happy cat faces are shown in this totally cute cat yin yang t-shirt design.